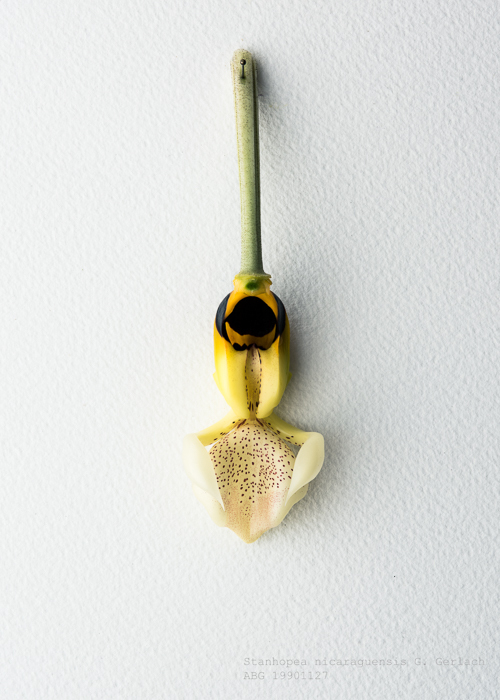 Stanhopea nicaraguensis 19901127 is a especially valuable plant in our orchid collection because it is a division of the holotype -the specimen used by the author to create a formal description for the original publication. The plant was originally collected in 1975 by John Atwood from the Peñas Blancos mountains in Jinotega department, Nicaragua. 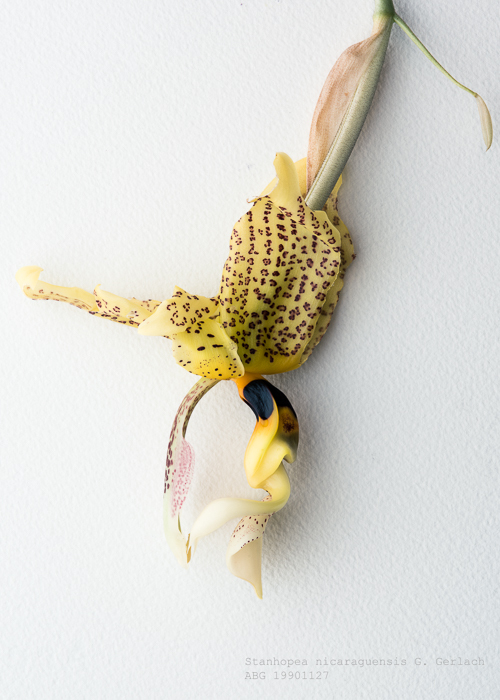 It flowered in June of 1990 at the University of Florida-Gainesville and we received a division as Stanhopea ruckeri. Another division of the UF-Gainesville plant was sent to Münich Botanical Garden and flowered in September of 2008. 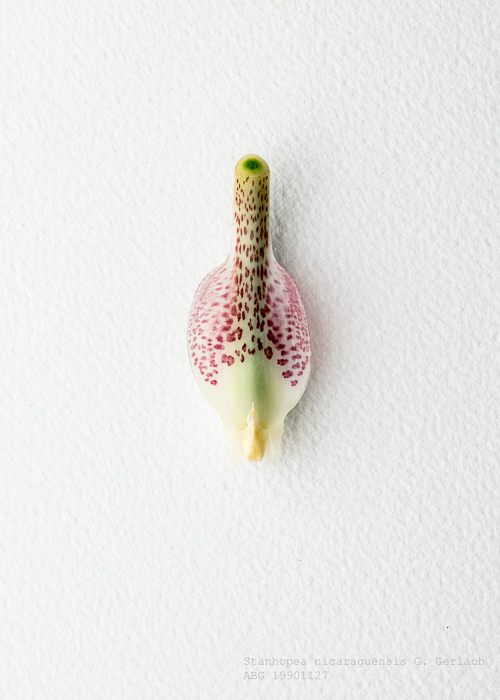 Günter Gerlach described it in Orchideenjournal No. 4, 2009, giving it the new name Stanhopea nicaraguensis. According to Gerlach, this may be the only clone currently in cultivation. Stanhopea nicaraguensis grows in montane rainforests in the departments of Jinotega and Matagalpa, Nicaragua at elevations between 600 and 1000 meters. The fragrance is 65% 1,8-cineole (think Vick's VapoRub), according to a fragrance analysis performed by Whitten and Williams in 1992. 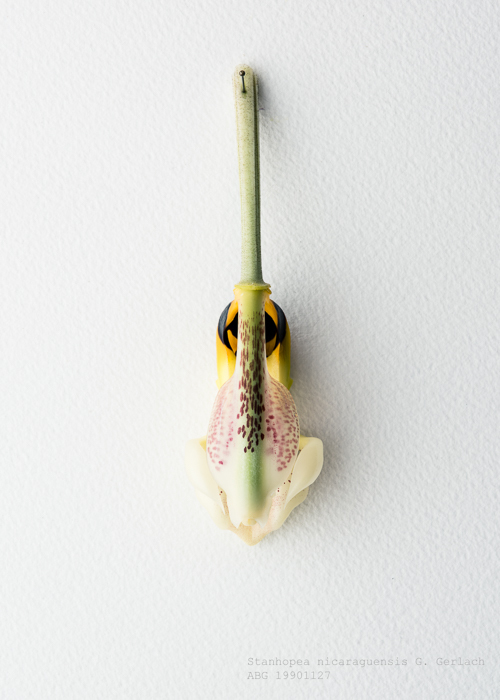 We're thrilled to have this rare orchid in our collection. And I am happy to report that we've got a nice fat capsule developing, which I expect will ripen in spring of 2016.